Hella E-code headlamps MAZDA - MiataRoadster - Stay tuned with MiataRoadster! 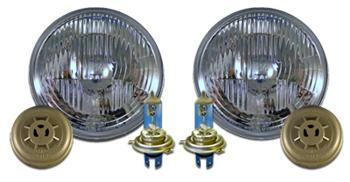 Hella’s glass E-code lamps use modern replaceable H4 bulbs that are available in a variety of wattages. They put far more light onto the road than standard sealed 7” DOT headlamps. For first-generation Roadsters, this is by far the most cost-effective improvement in lighting that you can make.